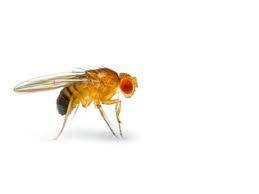 Fragile X Fruit Fly Research bears Fruit — FRAXA Research Fdtn. A new FRAXA-funded study shows how the hormone insulin – usually associated with diabetes — is involved in the daily activity patterns and learning deficits in the fruit fly model of Fragile X Syndrome (FXS). The study also reveal a metabolic pathway that can be targeted by new and already approved drugs to treat Fragile X patients, notably metformin. The scientists study the common fruitfly, Drosophila, whose genome contains a cousin, or homologue, of the human FMR1 gene called dfmr1. The lab of Thomas Jongens, PhD, an associate professor of Genetics, along with doctoral student Rachel Monyak and Sean McBride, MD, PhD, a psychiatrist at the Adult Developmental Disorders and Monogenic Disorders Clinic with Penn Behavioral Health, have been working with the fly model to find new therapies to treat the behavioral and cognitive deficits seen people with FXS. All three have FRAXA funding and are co-authors on the paper. FXS is an undertreated neurodevelopmental disorder characterized by a wide range of symptoms including disordered sleep, but its mechanistic underpinnings are not well understood. The team showed that select expression of dfmr1 in the insulin-producing cells (IPCs) of the fly brain was enough to restore normal day/night activity patterns and to rescue memory problems in the Fragile X fruit fly. This finding represents a dfmr1 expression in only 14 of over 100,000 neurons in the fly brain. When they looked closer at the insulin-signaling pathway in flies, they saw elevated levels of a molecule called Drosophila insulin-like peptide 2 in the IPCs and elevated insulin signaling throughout the mutant fly brain. Further study showed that reducing insulin signaling at different, specific time points is required to rescue circadian behavior and memory. Specifically, insulin signaling has to be reduced when the larva is transitioning to an adult in the pupae case to rescue day/night activity patterns, but can be reduced acutely in adults to rescue memory. “Our results indicate that insulin misregulation underlies the circadian and cognitive physiology displayed by the Fragile X fly,” Jongens said. “This means that a metabolic pathway can be targeted by new as well as already-approved drugs to treat Fragile X patients.” The team is moving forward to test metformin in a mouse model of FXS and to design a clinical trial in humans based on these fundamental studies. The study also included contributions by Xiangzhong Zheng and Amita Sehgal at Penn and the laboratory of Francois Bolduc at the University of Alberta in Canada. The study was funded by the FRAXA Research Foundation, the National Institutes of Health, the Department of Defense Autism Grant, and Autism Speaks.